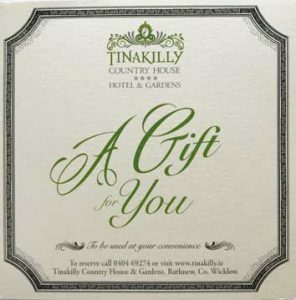 Surprise someone special with our beautiful Tinakilly Gift Card. Choose from a range of six, starting from €44. We can post direct with a personalised note. Afternoon Tea for 2. €44. Cosy up by the fire and enjoy Delicious Cakes, Tea and Cucumber Sandwiches for two. High Tea for 2: €54. Afternoon Tea of Delicious Cakes, Tea & Cucumber Sandwiches served with a chilled glass of Prosecco for two. Enjoy Supper for two accompanied by a lovely bottle of wine from our House Cellar. Overnight Accommodation in a 4-Poster Seaview room with a splendid breakfast for two. Overnight Accommodation in a 4-Poster Seaview room with a splendid breakfast and a 3 Course Dinner for two accompanied by a bottle of wine from the House Cellar. This gift card is a generic value card, so you can gift as much as you like. Afternoon Tea for 2. €44 Cosy up by the fire and enjoy Delicious Cakes, Tea and Cucumber Sandwiches for two. High Tea for 2. €54. Afternoon Tea of Delicious Cakes, Tea & Cucumber Sandwiches served with a chilled glass of Prosecco for two. Supper for 2. €100. Enjoy Supper for two accompanied by a lovely bottle of wine from our House Cellar. 4 Poster Seaview Room. €160 Overnight Accommodation in a 4-Poster Seaview room with a splendid breakfast for two in our East facing Halpin room. 4 Poster Seaview Room & Dinner for 2. €250 Overnight Accommodation in a 4-Poster Seaview room with a splendid breakfast and a 3 Course Dinner for twoaccompanied by a bottle of wine from the House Cellar.